The genus Aquilegia (Ranunculaceae) consists of approximately 110 species. Because Aquilegia species exhibit remarkable variation in floral traits (e.g., the shape and length of spurs, petal and sepal color, corolla size), the genus is considered to be taxonomically complex. In the course of preparing an account of Aquilegia for the Flora of Pan-Himalaya, researchers from Xihshuangbanna Tropical Botanical Garden (XTBG) and their collaborators collected some specimens with smaller flowers and yellow anthers from Qinghai and Gansu provinces. They found that the specimens were quite different from the previously recognized species. 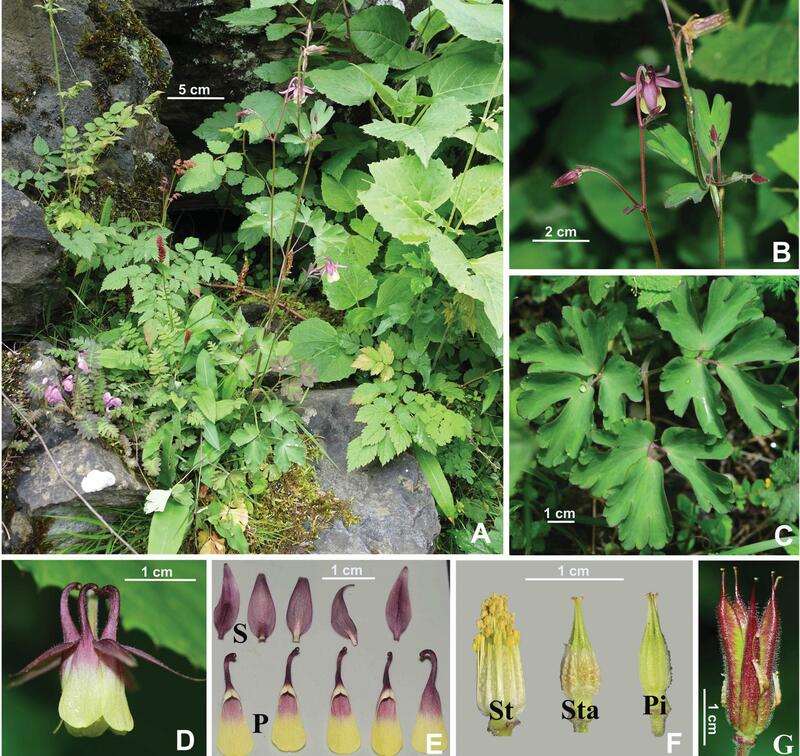 In 2015 and 2017, they successfully collected more fruiting and flowering specimens from Gansu, Qinghai and Sichuan provinces and determined that they represented a hitherto undescribed species, which they named as Aquilegia yangii. They got the new species published in Phytotaxa. Aquilegia yangii is similar to A. oxysepala in having dark purple (claretred to violet) spurs and yellow (yellowish-white) lamina. However, it differs due to its thin spurs (not gibbous at the base), which are shorter than the laminae, and yellow anthers. It is similar to A. kansuensis in leaf shape, suberect, oblong-elliptic petal laminae that are longer than the spurs, but differs by having smaller flowers, yellow petal laminae (vs. white), yellow anthers and a seed coat irregularly swollen without obvious outlines of epidermis cells. Aquilegia yangii is named after Prof. YANG Qinger, a Chinese taxonomist who has long been working on the family Ranunculaceae. Aquilegia yangii is distributed in Gansu, Ningxia, Qinghai and Sichuan in western China. It grows at margin of forests or on grassy slopes at altitudes of 2000–3000 m above sea level. It is flowering from May to June, and fruiting from June to August. Aquilegia yangii in the wild (photographed by LUO Yan in Jiuzhaigou, Sichuan, China). A. Habitat and habit. B. Portion of inflorescence with flowers and young follicles. C. Basal leaf. D. Flower. E. Sepals (S) and petals (P). F. Stamens (St), staminodia(Sta) and pistils (Pi). G. Follicles.